Alright, I had lunch in the Loop today at Goodwin’s, 175 North Franklin. The tortilla wrap (not burrito) above is the Santa Rosa. It’s served hot in a flower tortilla, filled with spicy black bean mix, chicken breast, pico de gallo, guac, Provolone cheese, and sour cream (which I had them hold). 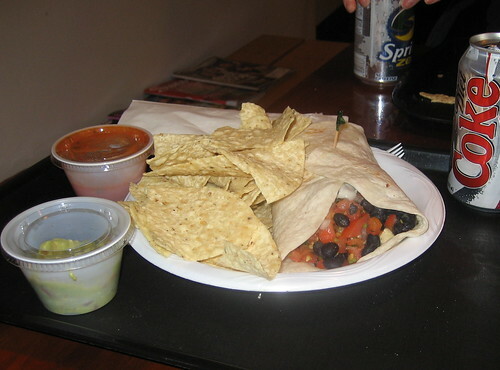 It was $6.50, and that includes the chips, the side of guac, and the side of salsa; the Diet Coke was extra. Great food and reasonably priced. I don’t like to eat wraps and burritos in front of other life forms. I just can’t seem to get it done without getting the ingredients all over my face. Trust me, you won’t be able to finish your meal if you look up from your food and see black beans, tomatoes, and chicken spread all over my mug. But this wrap is very manageable and can be consumed even amongst the most delicate of company. I had no problem eating it with very little hand-drip (leaching of sauce through micro-tears in the tortilla). They don’t overstuff it and they keep the tortilla in the steamer for just the right amount time. Great flavor, these folks are pros. It has exposed brick, not found often at Loop lunch spots…really cool! There is a second level, with a couch…ultra cool! They name sandwiches after California cities…wow, beyond cool! Now, I’m a dork , but when I left this place, even I felt cool. In fact, on the way back to the office I tried to bum a Gauloise off some guy, and I don’t even smoke, nor do I speak French. Hmm, go figure. Posted in food on 2007/01/20 by John.